Alla Prima Oil Portrait Demonstration. Alla Prima means 'At the first try,' It's conjures up images of thick paint, quickly capturing images without too much in the way of detail. 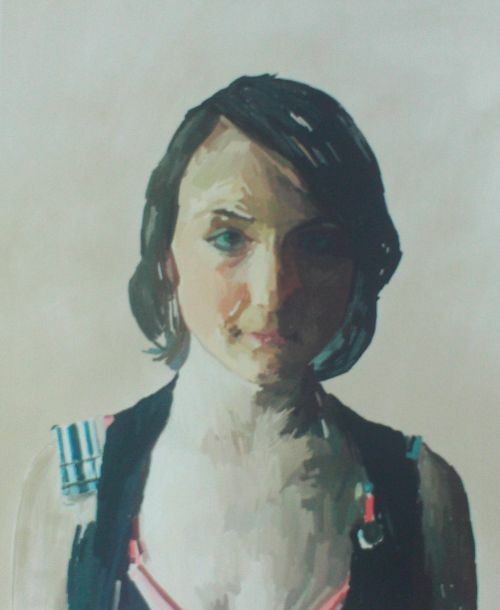 This is how I painted a portrait of a young woman using Alla Prima oil painting technique. Various flat brushes Turpentine Linseed oil. I based this painting on a pencil drawing and without any kind of colour study. It isn't strictly necessary to do a preliminary drawing but as I wanted to make up a colour scheme myself rather than painting from life or reference material I wanted to base the colours on tones worked out in a pencil drawing. The second consideration was to decide what I wanted to convey or emphasise about my subject. Whatever the painting (Alla Prima or otherwise) it's a good idea to have a goal like this in mind. Even in commissioned work you still have a lot of freedom, unless of course, your client has very particular wants. As my painting is just for demonstration purposes I have all the leeway in the world. This pencil drawing was done from life after careful consideration of all the angles. My emphasis was the girl's eyes and young complexion. This is why I chose a straight on, almost disconcerting pose. I decided on the scale of the work and cut off the desired size from a canvas roll. I then stapled it to a wooden board. After priming with acrylic gesso. I stained the surface a little with very thin emerald paint diluted with turpentine. I find it easier to judge the strengths of colour and tone if I have a gentle background colour. I also suffer from the fear of the blank page, as it's called. 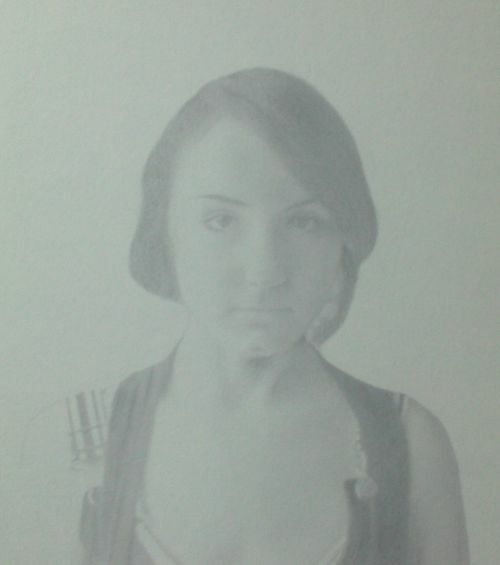 I trace in the subject using ordinary tracing paper and a charcoal pencil. This is where I choose the tones, darkest to light. Apart from any highlights, I will use these tones to judge lightest and darkest areas across the entire painting. The paint is diluted with linseed oil, about three quarters paint to one quarter linseed. I mix up various colours from viridian, cobalt blue and black. There is little variation between the colours and you will find this approach gives you the illusion of subtle colour changes on the canvas even though you have only mixed half a dozen colours. I paint in thick slabs almost obliterating the form of the eye but in reality, my strokes are very carefully placed and I ensure the charcoal shapes are followed faithfully. This is where my thorough pencil drawing comes in. It is my guide. I clean the brush thoroughly between switching colours to avoid muddying. I add cadmium deep red to the mix which creates some interesting browns. 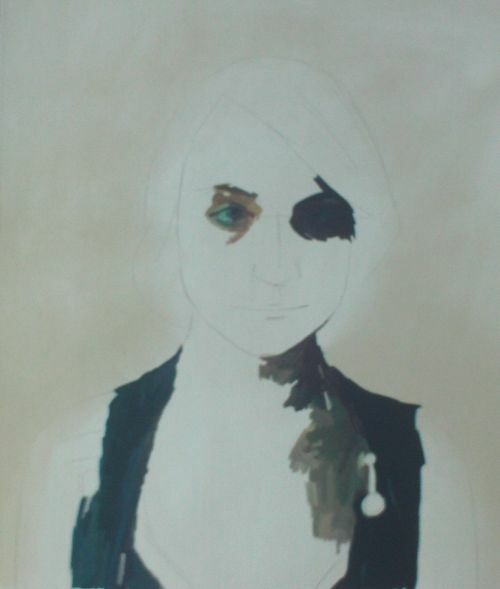 Moving across to the other eye I use the same paint mixes with added white and emerald. So basically all the colours are made up of various tones of each colour. This, I find, keeps the colour scheme easy on the observer's eye. 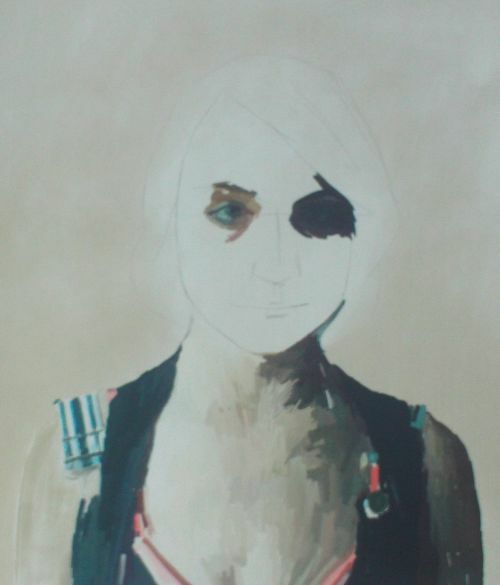 Using the eye in shadow as my guide I work across the darker areas, loosely brushing in slabs of colour. 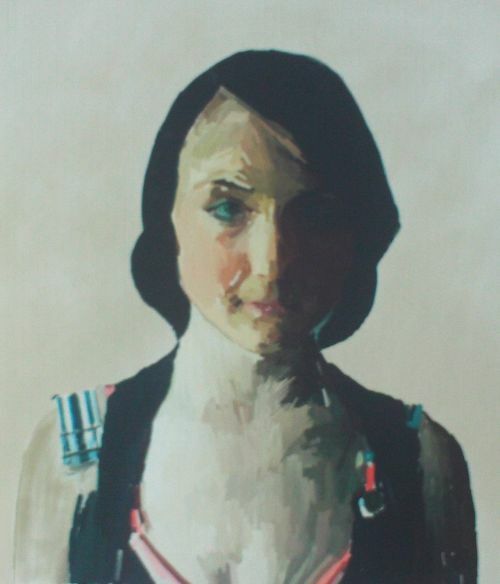 The shadowed area of the subject's chest gets a little lighter as we move over to the centre of the girl's body. Her clothing is dark to provide strong contrast against the skin tones. It is made from blue and burnt umber. Keep this colour separate from the others as we will need it later for the hair. 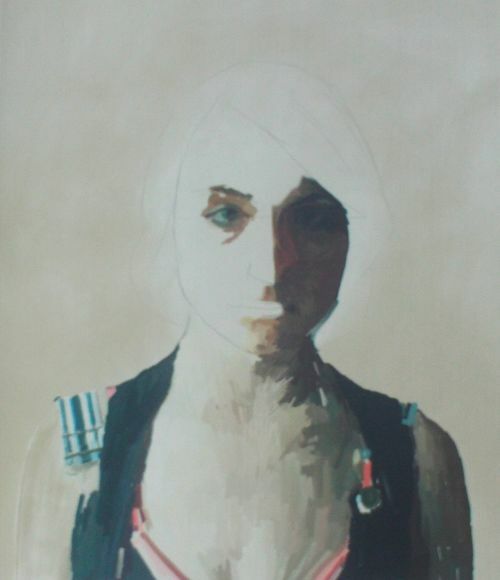 I finish off the clothing, the red and blue colours contrast well against each other and the flesh tones. 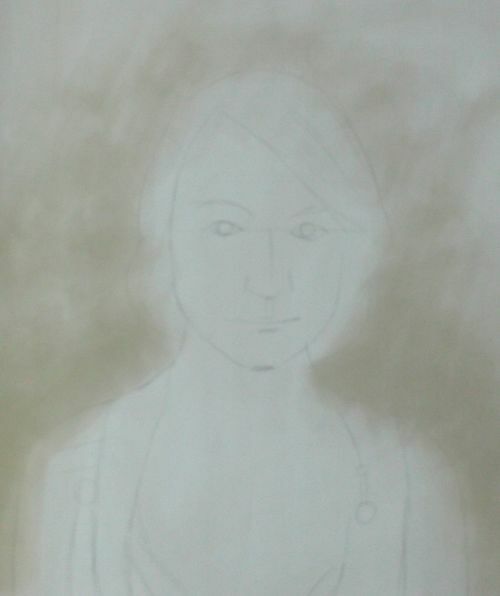 When the clothes are done I carry on across the skin, lightening and adding weak shadows where appropriate. Note the shadows between clothing and skin to the left. Correct placement of shade avoids flattening the image, particularly important with the Alla Prima technique. 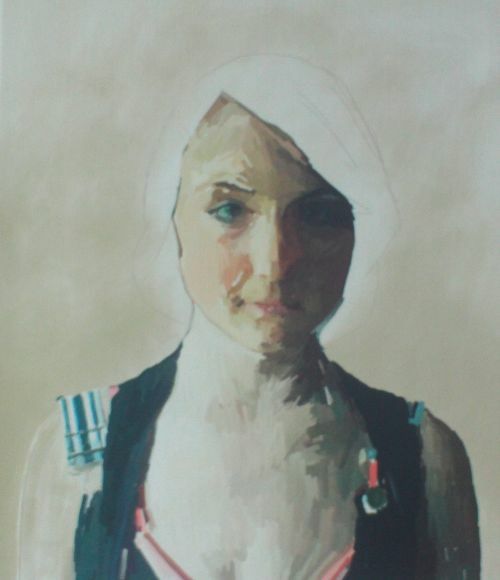 I apply colour in long bands down either arm still following the already established tones of the face and chest areas. There is strong contrast between the arms. The face is warmed up by adding colours about midway between the darkest tones and lightest tones around the eyes. To accomplish this I mix oranges made from cadmium yellow and deep red. This lends life to the face. By this time the painting will almost finish itself. Alla Prima lends itself to images made from colour and tone with little detail. I add lighter areas with warm oranges, yellows and a touch of emerald green. I made the cheek pinkish, with red and plenty of white. I add a little black to the deep blue I used for the clothing and block in the hair. Now the only thing left to do is add highlights to the hair in the same blocky Alla Prima slab method. Note the lighter parts of the hair are similar to the colours used in the clothing and skin tones. This balances the painting and helps to pull the colour scheme together. Alla Prima is a useful technique. Paintings can be completed relatively quickly although this doesn't have to be the case. It has a reputation as a speed method but that is certainly not the only way of utilizing it. Return to Portraiture from Alla Prima.